Price Soars For Key Weapon Against Heroin Overdoses : Shots - Health News Baltimore Health Commissioner Leana Wen is working to put the anti-overdose medication naloxone into the hands of as many heroin users as possible. But the price of the antidote has nearly doubled. A nasal spray version of the overdose-reversing drug naloxone demonstrated at police headquarters in Quincy, Mass., in 2014. Around the U.S., a worsening heroin epidemic has more and more cities turning to the anti-overdose drug naloxone to reduce deaths from abuse. Also known as Narcan, the medication blocks the effects of opioids and reverses the respiratory depression that occurs during an overdose. Baltimore recently stepped up its naloxone training, focusing on drug users, and their families and friends. 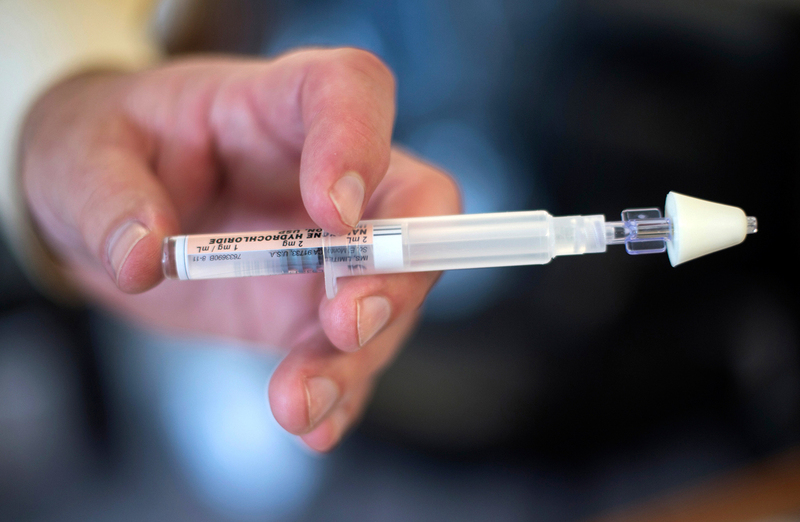 So far this year, city health workers have taught nearly 4,400 people how to use naloxone. That's more than quadruple the number trained in 2014. A big concern for Baltimore and other cities is the price of naloxone, which has risen dramatically as demand has gone up. In February, the Baltimore City Health Department was paying about $20 a dose. By July, the price had climbed to nearly $40 a dose. Maryland Rep. Elijah Cummings, ranking member of the House Oversight and Government Reform Committee, places the blame squarely on the manufacturers and, in particular, Amphastar Pharmaceuticals, the company that makes the naloxone most widely used by health departments and police. "When drug companies increase their prices and charge exorbitant rates, they decrease the access to the drug," Cummings said this summer. "There's something awfully wrong with that picture." Amphastar says it raised prices because of increased manufacturing costs, including a rise in the prices of raw materials, energy and labor. Naloxone isn't a new drug. It was first approved by the Food and Drug Administration in 1971 as an injectable medication, used primarily in hospital settings. Today, Baltimore and other cities are choosing intranasal naloxone for community use — naloxone that can be sprayed into the nostril and doesn't require needles. The intranasal delivery method isn't explicitly approved by the FDA. Amphastar is currently the only company that makes naloxone in a dosage that can be administered that way. Daniel Raymond is policy director for the Harm Reduction Coalition, which advocates for broader access to naloxone. He discussed naloxone pricing over the years, the changing market for the drug and what it means for prices and competition. Here are highlights, edited for length and clarity, from a conversation with All Things Considered's Audie Cornish. When we started following this issue, it was over 10 years ago, and for the injectable naloxone it was about a dollar a shot. Each vial was dirt cheap. So it's been a really dramatic increase over a fairly short period of time. 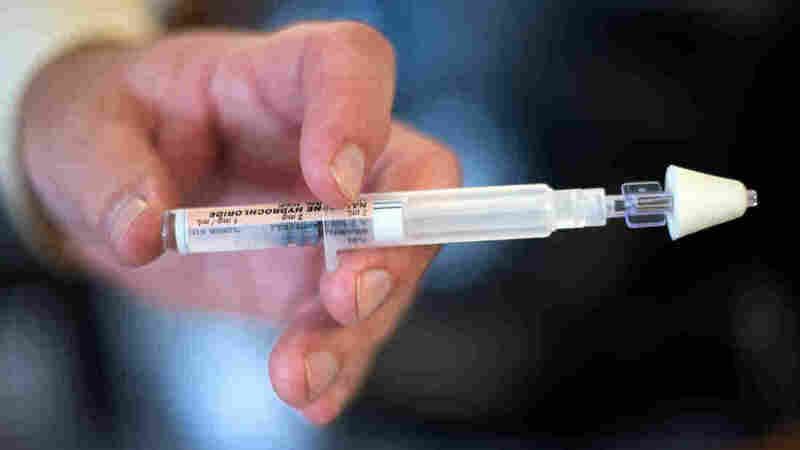 Emergency rooms have traditionally been the main purchasers of naloxone. It's also used by anesthesiologists, and it's been used on some ambulances. So it was typically a hospital market. The hospital would buy in bulk, and there wasn't a whole lot of prescribing going on. Now we've got over 40 states that have passed laws facilitating access to naloxone, and have first responders carrying it and community distribution. That's the majority of the country that's moving in this direction of making naloxone more accessible. Amphastar is currently the only manufacturer in the U.S. who makes the dosage of naloxone used for intranasal administration. They have no competition. They can set whatever price they want, and almost a year ago, they decided to almost double that price. It's hitting programs and health departments and first responders across the country really hard. There are a couple companies that saw the need for an FDA-approved intranasal naloxone device. They've designed new devices that they've submitted to FDA for approval. So, I'm hoping by the end of the year, we'll have one or two other intranasal naloxone devices available. The challenge will be whether these companies decide they want to compete on price, or they just want to take a share of the market. What the makers of Evzio — a company called kaleo — thought about was: Can we make something that your grandmother could use? So they designed this cartridge that's an auto-injector. It actually talks you through the process of reversing an overdose. Now, they needed to do the research to show they had the right dose, to show that people could actually follow the instructions and use it without any training at all. And they needed to do all the manufacturing and assembling. So those R&D costs start to add up. The costs of the production line start to add up. Their gamble was, if they could take the complexity of educating somebody out of the picture, then they could drive more doctors to prescribe this. I think their choice in front of them is that they can have a narrow market at higher prices, or a much broader market at lower prices. Either way, they're going to making money. The latter way, they're saving more lives. NPR and All Things Considered will continue reporting from Baltimore in the coming months, checking in with Baltimore Health Commissioner Leana Wen and her team periodically. Stay tuned for future stories.